If you are Active on Airvoice GSM Plan C, your account number is AIRVOICEGSM. Note: do NOT use your wireless number as your account number, as this will process the payment incorrectly. If you are active on Airvoice GSM (plan C), you will need to choose the denomination of airtime you would like to purchase. Give the form to the Western Union clerk, who will then process your payment. 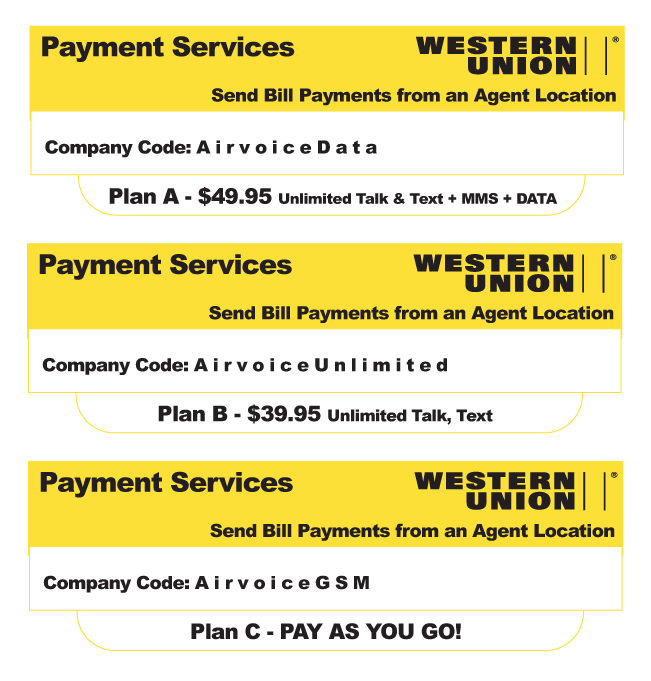 The Western Union agent will now provide you with a receipt. This receipt will contain a 15 digit PIN that you will need to download either directly from your handset, or by calling customer service. If at any point you or the Western Union agent requires assistance, please contact Airvoice Customer Service at (888) 944-2355.